Singer Jack Jones will perform the seasonal honors. 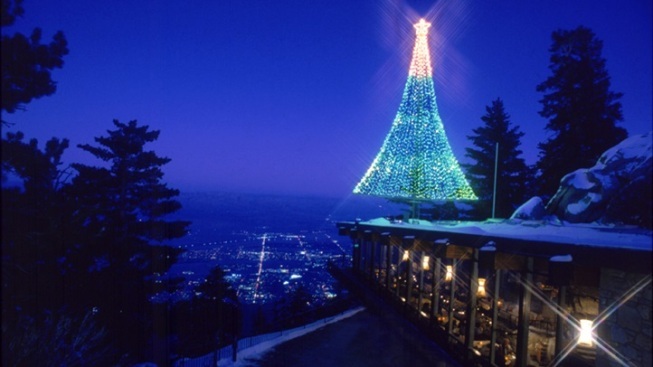 The mondo LED tree atop the Peaks Restaurant at the Palm Springs Aerial Tramway gets a-glowin' on Sunday, Dec. 7. IT'S A TREE: Have you ever gaze up the side of a very large hill, or even a mountain, because a twinkling light in the distance caught your notice? And did you ask the people you were with "hey, what is that up there? A house? A fallen star? A particularly powerful campfire?" It can be a mystery to see a light upon a mountain. But, starting on Sunday, Dec. 7, when you see a certain sparkle up the side of Mount San Jacinto in Palm Springs you won't have to guess at its mysterious origin: It'll be the Palm Springs Aerial Tramway Christmas tree, a 6,500-LED light sparkler that stands large 'n lovely atop Mountain Station. SINGER JACK JONES... shall be the 2014 honorary tree lighter, and the Palm Springs High School Madrigal Singers will lend their voices to the festive evening proceedings. The tree, by the by, is 45 feet tall "and can be seen from throughout the Coachella Valley." If you can't make it up the side of San Jacinto for the first night of celebrations, singing groups'll lend seasonal flavor over several other December nights, including Dec. 19, when the Cathedral City High School Choir brings the caroling cheer. Santa'll be on the revolving tram on Dec. 20, ho-ho-ho-ing and visiting with good girls and boys (and men and women). AS FOR THE SNOW GUESSING CONTEST? As to when the first inch would fall at Mountain Station? That is now over and done, as, yes, flakes fell in a flurry on Friday, Nov. 21. Over 554 people made guesses, starting on Oct. 1, which is the usual start to the tram's annual "when will it snow?" contest. For, you betcha, Mountain Station not only has Santa, and a see-it-from-all-over LED tree, but it does get that Christmassy cold stuff starting at just about this time of year.